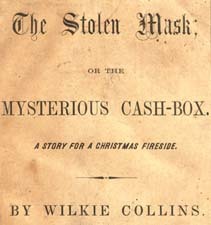 Wilkie Collins, 1824-1889 The Stolen Mask; or The Mysterious Cash-box. A Story for a Christmas Fireside. The Stolen Mask; or The Mysterious Cash-box. A Story for a Christmas Fireside. Columbia, S.C.: Steam Power-press of F.G. DeFontaine, 1864.